With Mother’s Day just over a week away on 13 May, now’s the time to start making reservations at our mums’ favourite restaurants, and shopping for gifts. While showing appreciation and love to these important ladies is something we should do every day, Mother’s Day gives us an even bigger excuse to pamper them further. And what better way to do so, than with a gift of jewellery? One brand to look to is PANDORA, which has launched an exquisite new collection comprising three jewellery lines and several additions to its existing Essence range. Spanning charms, bracelets, rings, necklaces, pendants and earrings, these lovely hand-finished creations are adorned with white, lavender and pink details. Among the Mother’s Day jewellery highlights is the The Language of Love series, which features dainty jewels in various metals such as sterling silver and PANDORA Rose. Its designs include the Love Statement pendant (see main image above) — an 18k gold-plated sterling silver jewellery piece embellished with silver enamel and etched with the words “love you more”. The Perfect Mum dangle (right) is perfect for expressing your love to your beloved queen. Another equally stunning option? The Mom & I series, which features charms with whimsical motifs of teddy bears and hearts, and crafted with pink and purple stones, enamel and glass. Standout pieces include the Perfect Mum dangle, which spells out “mom” in sterling silver and embellished with heart-shaped pink crystal and lilac crystals, and Teddy & Balloon charm — composed of an adorable teddy bear clutching its toy rabbit in one hand and a balloon string in the other. The latter charm is fashioned in silver, silver enamel and clear cubic zirconia. Here’s a closer look at the charms on the bracelet. If your mum is more inclined towards simpler, sleeker designs, consider the Bonds of Love range, which is decorated with silver bow motifs. Take a bow with the Bonds of Love jewellery line. Our pick is the Brilliant Bow Bracelet, a slender silver bracelet bedecked with clear cubic zirconia for a hint of sparkle. There are also matching bow earrings, a charm and a ring available. 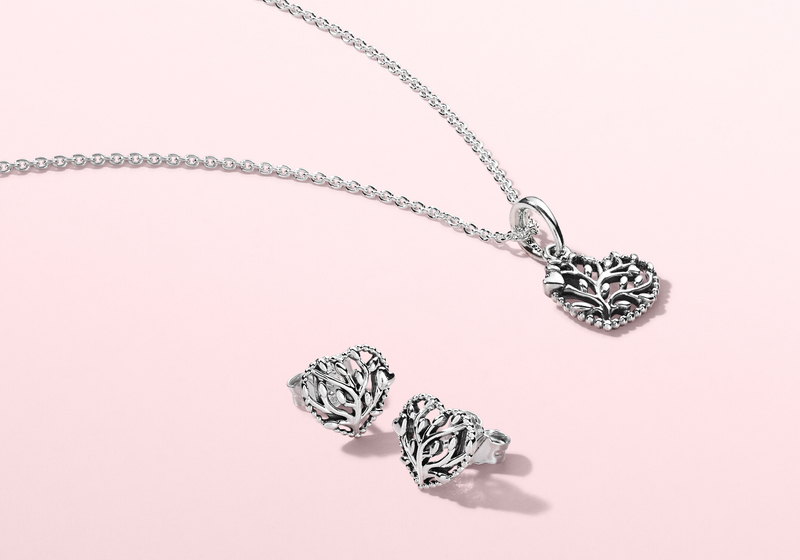 The Love Promise gift set is exclusive to PANDORA’s online store. PANDORA’s Mother Day collection also includes three gift sets titled My Mom, In My Heart, and Love Promise (which is an online exclusive). If you’re already making a list of items to get for mum, here’s some good news to look forward to: From now till 13 May, while stocks last, customers will receive a complimentary limited edition Pattern of Love bangle with a minimum nett spend of S$230. The Pattern of Love bangle features an embossed circle and heart pattern, and is a versatile jewel that’ll match anything. The Mother’s Day jewellery collection is available in all PANDORA stores islandwide, as well as at PANDORA’s online store here.